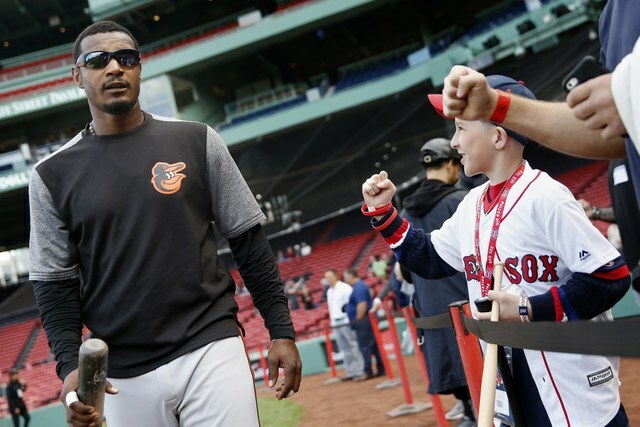 BOSTON (AP) — Orioles outfielder Adam Jones said Tuesday that racial taunts that prompted immediate condemnation around baseball and Boston have no place in today’s game but speak to larger racial issues in the United States. 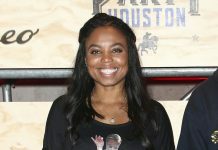 “I thought we’d moved past this a long time ago,” said Jones, who said he heard fans call him the N-word on Monday night and had a bag of peanuts thrown in his direction. “With what’s going on in the real world, things like this, people are outraged and are speaking up at an alarming rate,” he said. 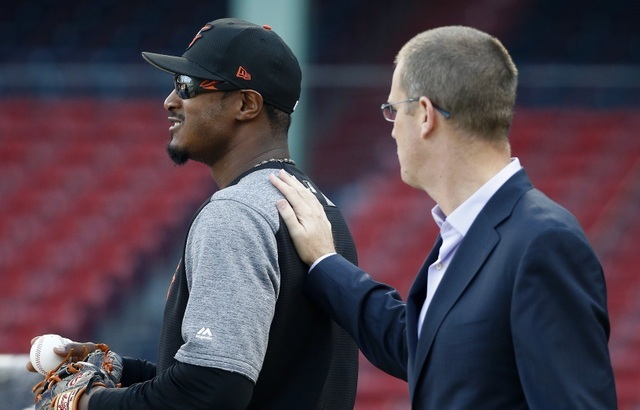 Jones received a personal apology from Red Sox team president Sam Kennedy on behalf of the club. When he stepped up for his first at-bat during Tuesday night’s game, he was also given an extended applause from the Fenway crowd, with Red Sox pitcher Chris Sale stepping off the mound to allow the applause to continue. The All-Star said he felt “it was just the right time” to speak out. Kennedy said 34 people were ejected for various reasons Monday night and reiterated the team’s “zero tolerance” policy for such incidents. He also said there would be extra security around the outfield Tuesday night. Kennedy said that 10-15 people are usually ejected from Fenway any given night, calling the 34 ejected Monday usually high. Along with the fan ejected for throwing the peanuts, a second fan was ejected for using foul language toward a player, though the team didn’t know whether the fan used the bad language toward Jones. Kennedy and manager John Farrell separately met with Red Sox players on Tuesday and said the players said they’d experienced similar incidents in both Fenway and around the league. “I think one person hears an inappropriate remark or slur, that’s one person too many,” Kennedy said. Boston’s professional teams — like the city’s neighborhoods — had different reactions to the civil rights movement and the integration of professional sports. While the Celtics and Bruins broke barriers in pro basketball and hockey, the Red Sox were the last Major League Baseball team to field a Black player. In the 1980s, the Red Sox also dealt with an incident during spring training in Florida in which an Elks Lodge was giving passes to only White players. It also wasn’t until last season that the New England Patriots started a Black quarterback for the first time in its history. Rookie Jacoby Brissett started two games with Tom Brady suspended as part of his “Deflategate” punishment and backup Jimmy Garoppolo injured. “It’s changed a lot over many years, but it sure takes a long time to change everything,” said Steve McHugh, who is White and said he’s been a Red Sox fan since he moved to the Boston area in 1977. Michael Towns, 39, has been a casual fan of the Red Sox since attending the University of Rhode Island. Outrage and condemnation flowed from around Major League Baseball on Tuesday. “You get called names, N-word, all kinds of stuff when you go to Boston,” Yankees pitcher CC Sabathia said. Monday’s incident also touched off widespread social media use of the hashtag #BostonWrong — a dark twist on the post-marathon bombing #BostonStrong. “I’m glad they kicked the guy out and I hope they never let him back in ever again,” the Republican told reporters. Police Lt. Mike McCarthy said a fan threw a bag of peanuts at the Orioles’ dugout and hit a police officer posted nearby, not the center fielder. He told The Associated Press that security officials had the man thrown out before police could identify him. Jones, a five-time All-Star, said he has been the subject of racist heckling in Boston’s ballpark before. The Red Sox said any spectator behaving poorly forfeits the right to be in the ballpark and could be subject to further action. “The racist words and actions directed at Adam Jones at Fenway Park last night are completely unacceptable and will not be tolerated at any of our ballparks,” Baseball Commissioner Rob Manfred said in a statement. Hall of Famer and Yankees senior adviser Reggie Jackson said the incident with Jones proves the United States has a long way to go with race relations. AP Sports Writers Mike Fitzpatrick in New York and Charles Odum in Atlanta, Associated Press writers Steve LeBlanc and Bill Kole, and videographer Rodrique Ngowi contributed to this report.